R.C. 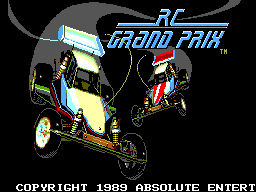 Grand Prix is a Sega Master System and Sega Game Gear game developed by Absolute Entertainment and published by Sega. It is a racing game, in which the player controls a radio controlled car, competing against other drivers around a track. The Game Gear version of the game was only released in North America. Main article: R.C. Grand Prix/Magazine articles.